Many people think of the Surface Pro as a tablet for serious work, but according to Surface chief Panos Panay, Microsoft's slates haven't even truly gotten down to business yet. Speaking at the company's annual CIO summit this week, Panay said that Microsoft is "right on the cusp" of bolstering the Surface lineup's business chops after admittedly targeting consumers out of the gate. Though he didn't provide many specifics, CITEWorld reports that Panay mentioned one enterprise-friendly option coming to the company's now-patented Touch and Type Covers. "They’ll be customized for organizations in the future," he said. "You’ll start to see these get customized and transformed." Panay's comments come on the heels of a new commercial ordering option for the Surface tablets, which allows businesses to buy both the Surface Pro and Surface RT, their accessories, and optional 3-year "Surface Extended Hardware Service Plans" in bulk after creating a volume licensing agreement with Microsoft. Even if Microsoft designed the Surface series with consumers in mind, the Surface Pro tablet is chock-full of features enticing to the suit-and-tie crowd. It's the first tablet to sport a full-fledged Intel Core i5 processor, giving the tablet Ultrabook brawn in slate-like form. And unlike the Surface RT, the Surface Pro's Core processor gives it the full-blown capabilities of Windows 8, complete with the ability to join domains and run legacy apps, virtual machines, and VPN software alike—all crucial capabilities to corporate users. 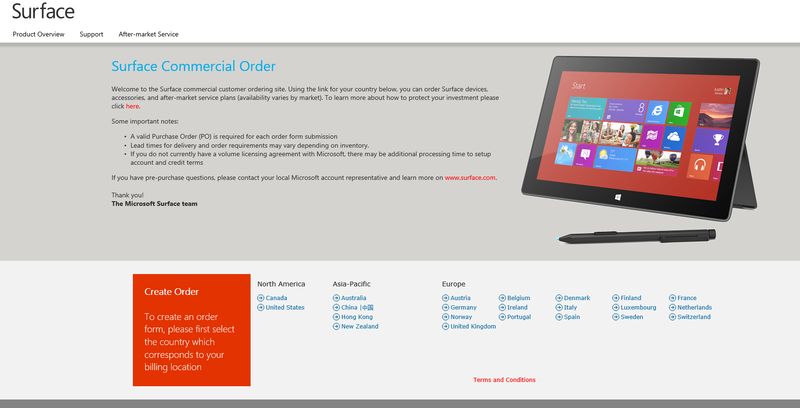 Microsoft's website for commercial Surface tablet orders. Beyond software, the Surface Pro already sports business-friendly hardware features such as a Mini DisplayPort, an included stylus, and the computational chops to drive a discrete 1080p display without breaking a sweat. Few tablets can make all of those claims. Indeed, the Surface lineup already stands out as a star of the business tablet class, even if it's not selling like gangbusters. What else could Microsoft possibly pull out of its hat besides modern UI-style Office apps or business-focused software similar to what's already found in enterprise offerings from Dell, Lenovo, and others? I'm not sure, but I'm definitely intrigued.